All current employment opportunities are highlighted on the employment page of this website. 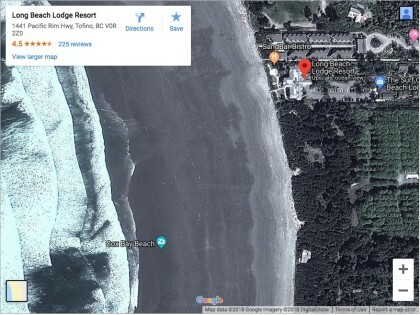 Long Beach Lodge Resort is located 7km south of Tofino on the West Coast of Vancouver Island. 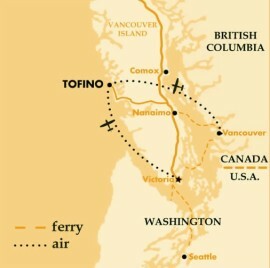 The area is accessible by air into Tofino Airport from Seattle, Victoria and Vancouver, or by car travelling west across the Island on Highway #4 to the Pacific Rim Highway. The GPS coordinates for the Resort are latitude 49.104787, longitude -125.872485. A variety of car and/or passenger ferry services onto Vancouver Island are available: Seattle to Victoria, Port Angeles to Victoria, Vancouver to Victoria, Vancouver to Nanaimo and Powell River to Comox. Major airports on Vancouver Island are located at Victoria, Comox and Nanaimo. Car rentals are available at all of these airports as well as through the Budget kiosk at the Tofino Airport.